Last week, a new legal challenge arose for Apple's massive data center in Galway County, Ireland at the hands of three individuals in the nearby town of Athenry, who filed official complaints against the data center with the Galway County Council, local planning body An Bord Pleanála, and even the High Court. Today, the Irish High Court has ruled in Apple's favor and pledged to fast-track building approval of the data center following months of roadblocks and red tape (via Business Insider). Specifically, the court has decided to put the dispute between Apple and the three individuals on the "commercial list," a dedicated section of the court which deals with cases that have more than €1 million at stake. Because of this, the case "must be concluded within six months," and Apple will be able to eventually begin construction of the data center, which is intended to power services like the App Store, Apple Music, Apple Pay and iCloud. Local politician Ciaran Cannon wrote on the Athenry for Apple Facebook group: "Very good news from the High Court just now. The Fitzpatrick/Daly proceedings have been admitted to the Commercial Court list. This means that the hearing must be concluded within 6 months, rather than the 18 months for a normal Judicial Review case. Their case will now be be heard on the 21st of March. The application to admit the third objector, McDonagh, to the same list will be heard next Monday." 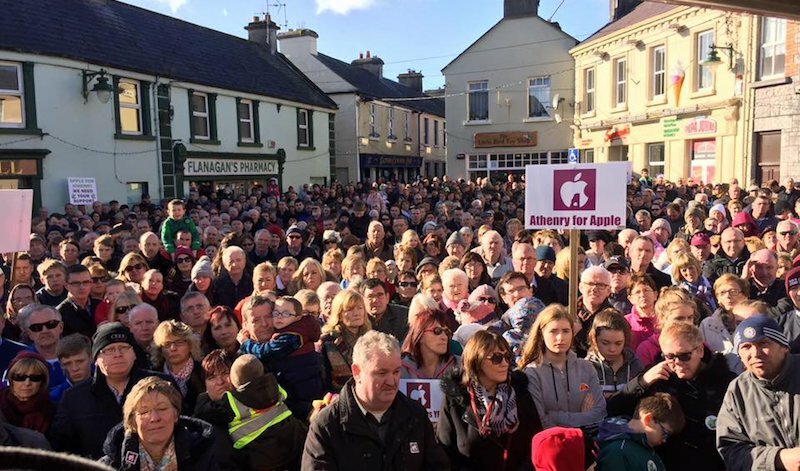 Today's decision followed a local march in Athenry yesterday organized by citizens in the town and its surrounding villages -- with more than 2,000 in attendance -- to show Apple that only a vocal minority was against the data center, and that most people are fervently in support of the Cupertino company's presence nearby. The citizens in support of Apple believe its data center will introduce new jobs to the area and boost the local economy. Marching for iCloud. Never thought we'd see the day. I wonder what their slogan would be. "We're here! 5 gig tier! And we'd like to say hello! (again)"